Nike Zoom Fly Flyknit Men's Running Shoe is built for record-breaking speed. The Flyknit upper delivers ultra-lightweight support that fits like a glove. Nike Zoom Fly Flyknit Men&apos;s Running Shoe is built for record-breaking speed. The Flyknit upper delivers ultra-lightweight support that fits like a glove. Flyknit upper provides lightweight breathability. Fusible yarns create zones of structure and support without adding weight. Full-length carbon fiber plate is the same plate used in the VaporFly 4%. Traction pattern uses different shapes and sizes for stability and propulsion off the ground. This is a great shoe as its very cushiony and feels good on the feet. 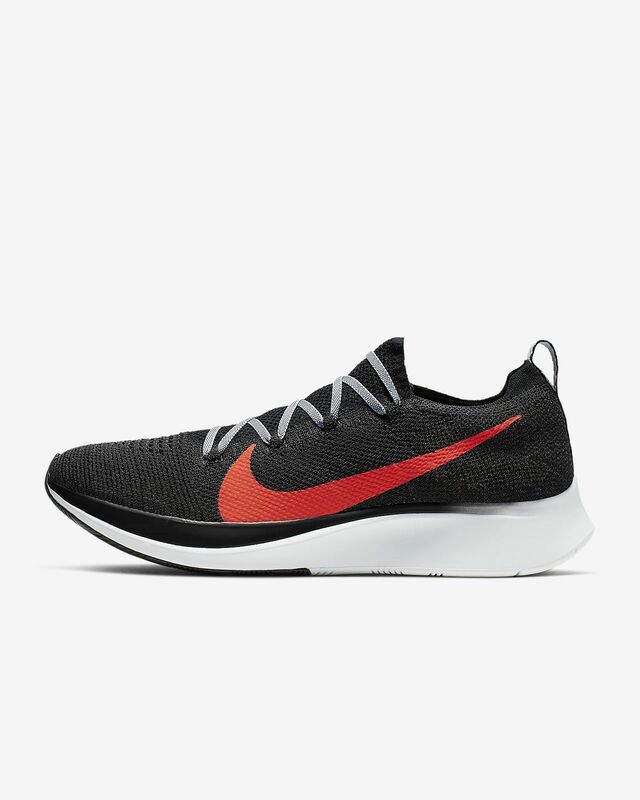 The Flyknit forms to your feet and I prefer it over traditional uppers on shoes. The only problem is its hard to lock your foot down with the laces since they are not designed in a traditional way. I ended up purchasing a 1/2 size smaller and the shoe fits perfect. 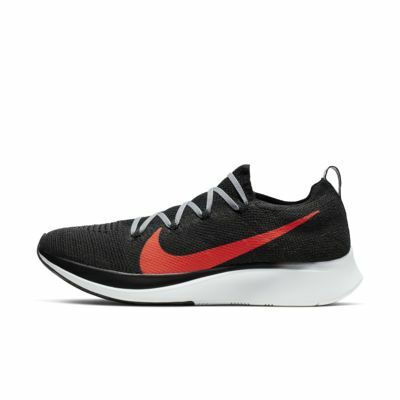 The Flyknit expands so I didn't need my true size and now I am able to lock my foot into the shoe better. I hope Nike makes more of their shoes in bright colors like the Light Blue which is almost sold out as their other darker colors dont seem as popular. Also I do hope they design a lacing system which will lock your foot into the shoe better than what they have now. Overall its a great shoe for all runs and I switch it out with my Streak 7 throughout the week. Just make more shoes in brighter colors and a better locking system and this shoe will be perfect. I love these shoes! My last couple of runs have been amazing. They are so comfortable and add a bit of a spring to your every step. They really helped with my IT band issue and my knees feel so much better. 100% recommend these shoes!! After 100 miles....the bottom outsole on the outside of the shoe started to wear...after 140 miles, the carbon fibre plate was exposed...seems like maybe there's an maybe an 1/8 inch of outsole that covers the plate. These were strictly flat street miles.